We provide a variety of different HVAC services to commercial and apartment buildings in Etobicoke, ON. 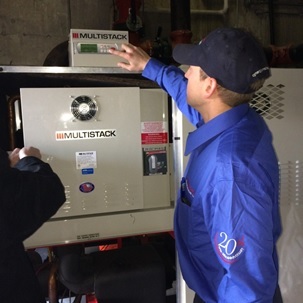 HVAC – A properly functioning HVAC system is crucial to the overall comfort of your employees or tenants. At Cynergy Mechanical Ltd., we provide a variety of different HVAC services to commercial and apartment buildings in the Greater Toronto Area, including Etobicoke, Ontario. These include computer & server room air conditioning units, heat pumps, packaged rooftop units, make-up air units, split & ductless split air conditioning systems, Dry-a-Tron dehumidification units, and more. When we started providing HVAC services to Etobicoke, Ontario and the surrounding Greater Toronto Area in 1994, our team was compromised of only a few professionals. Today, we boast a team of more than 35 and believe that it is the quality of our workmanship and customer-oriented philosophy that has allowed us to expand our operations up to this point. Not only are we dedicated to meeting all of the HVAC needs you have for your building, but we are also there to ensure that your systems are running as efficiently as possible. We will make sure that any upgrades or improvements we provide you with are better than industry minimum standards, so you are able to benefit from economical and long-lasting solutions. For additional information on our HVAC services and what they entail, contact our team at Cynergy Mechanical Ltd.
At Cynergy Mechanical Ltd., we offer high-quality HVAC services in Toronto, Mississauga, Etobicoke, the GTA, St. Catharines, and surrounding areas of Ontario.